﻿﻿﻿﻿﻿﻿﻿﻿Natural rubber is a wonderful option for those looking for pacifiers, teethers and even bath toys that don't contain PVC, phthalates, BPA, etc... In addition to being non-toxic, they are made without petroleum from naturally sourced, sustainable material, and they are biodegradable. When I was pregnant, Natursutten was the only company I found that made natural rubber pacifiers or teethers. It is a Danish company that manufactures their products in Italy. Since then, others have joined the natural rubber market. Hevea Baby makes pacifiers, a teether and bath toys. My daughter adores the bath toys, and the advantage to them is there are no holes for water to get in and grow mold inside. Here is a video from Hevea about the process of making natural rubber toys. 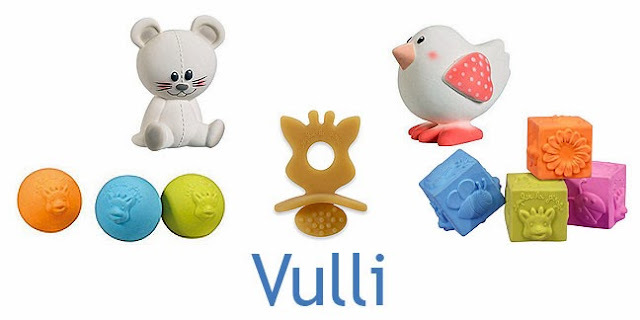 Vulli, makers of the famous Sophie the Giraffe teether, came out with their "So'pure" line that includes a 100% natural rubber version of Sophie, as well as other toys like natural rubber cubes and balls. Made in France, the line seems to be continually expanding - most recently adding other animals like the mouse and bird pictured here. Some are easier to find in the US than others. Finally, there is also Lanco, a manufacturer of natural rubber toys from Spain, with teethers and hand painted bath toys. They have been around since 1952, and have a wide variety of bath toys and teethers that are becoming increasingly available here in the US. The thing I like about these mats by VitaFutura is not only are they made of natural rubber, but they are also made in Germany, whereas all of the others are from China. They are available in numerous styles, sizes and colors, including white. Most say they are natural rubber and made in Germany - please check the individual product descriptions on the link provided. The Vermont Country Store carries two different white mats made of natural rubber, sized for a tub and a shower stall. A small mat from Slip Solutions (also available in a large size), which is very affordable and comes in 3 colors. Kikkerland makes mats in several cute kids designs like this whale one. Ginsey mats come in blue and white, in sizes medium, large and extra large. There is also a shower stall size. We love, love, LOVE our Glueckskaefer sailboat in the bath! We've had it for over a year now with no mold problems (we always let it dry out well after the bath). In fact, it still pretty much looks brand new. Little Spruce Organics carries a few of these boats that are made in Germany, as well as some pine boats made in Maine. Mama Made Them on Etsy has a great selection of wooden bath toys - all handmade in West Virginia. Some fans proclaim that they are sturdy and wonderful as is, while others have said that to protect them and get them to last even longer, occasionally rubbing them with a beeswax finish can be helpful. Finally, you can always go outside the box when it comes to bath toys. Of course I have new things pictured here, but these sorts of things can be purchased at thrift stores, yard sales or even just passing down old kitchen tools. Stainless steel is a great option for the bath.